Love the scourge art and colours! died and is a ghost. This sounds fun and looks great (I like all your color choices especially)! If your Twitter doesn't have enough depression and awkward pomposity, here you go. Right now the pawns move how they should in the game, however there is a bug when clicking on a new pawn while another is active. It's causing some warping pawns basically. Gonna look into fixing that tomorrow. But now I must sleep, because I am already up way too late working on this. 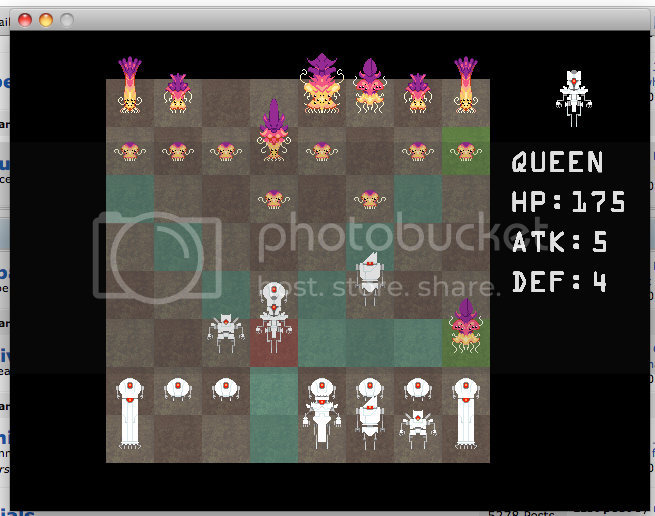 Fixed the bug that was happening on the pawns, and set up the attack logic for them as well. They ALMOST work correctly now. I'm hoping that by figuring out how to make the movement logic for the pawns, doing so for the other pieces will be easier. also, you should try to make it with real multiplayer. shouldn't be too difficult for a turn based game. that goes for everyone who is currently doing a turn based "hotseat" multiplayer game!!! with people is real multiplayer. looks cool, I hope you give the board a more interesting treatment though like you did the characters. I think he meant that calling over-network MP more real than hotseat multiplayer seemed odd. As for actually doing that, I have nowhere near the capacity for such a thing for the purposes of this compo. But perhaps if I can get enough done to entice a proper programmer, we can make it happen. 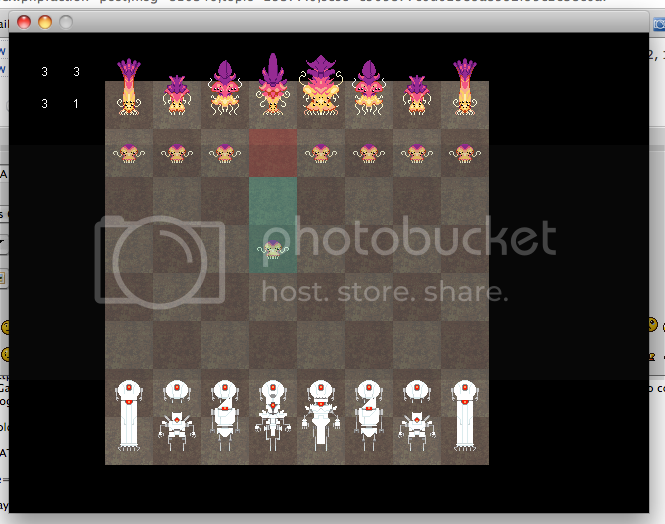 Also, yes, the board is a placeholder, and I hope to give it a proper artsy treatment once more of the code is done. I have enough to work with, I can always go back and improve the graphics after the fact. After what I thought was a good day, I've hit a snag: I can't for the life of me figure out how to do diagonal movement through an array. I'm going to have to figure out a better way to do it, because right now, it's fucked. If anyone knows where I can look, or knows enough game maker to do it, let me know! This is pretty much the last thing I need to figure out before moving on to the Strategy stuff. What is the problem with diagonal movement? The problem wasn't with checking the array diagonally, it was stopping it when it moved outside the bounds of the board. I fixed it though. Didn't realize it was such an easy problem. Gonna finish off the queen and then upload a video/the game itself. The capturing logic still needs to be put in, but yeah. Feelin' pretty good! Okay, so the logic for the movement is done! I need to decide how to handle attacking still though... hopefully I can get some logic for that done soon and then release a build to play around with. It'll still be pretty rough at this point, but I'm more interested in getting people to play it rather than hold on to it until the end. All the piece movement logic has been implemented, and stats have been attached to each of the pieces. Now to figure out how to add more tactical/ TBS elements! Suggestions totally welcomed! What do you guys think would be cool? Maybe units could choose to shoot along their possible movement range instead of moving, dealing less damage than melee. Limited ammo, possibly? Also different/randomized terrain types on each tile, maybe. And pawns NEED to self-destruct and explode, their shape says so. Gonna put a build up as soon as I can figure out how to get one up... Turns out Game Maker for Mac (Which I am using unfortunately) doesn't allow publishing of games in the Lite version. Stay posted... hope to have a playable build up by the end of today. As far as I know, all basic movements and attack work. It's not entirely balanced, but you can at least play chess with it. white (robots) start. Let me know what you think so far! It's not all that impressive yet I know.